I have a new tool in my blog’s sidebar: a Twitter widget. I’m now on Twitter, which is a way of following what your friends are doing. It’s a micro-blog, of sorts. I’m still figuring it all out and exactly my strategy for using it. Looks like fun – a way to keep in touch in your “virtual” community. You can follow me on Twitter by looking at my sidebar or going to Twitter and click on Follow. This entry was posted in Blog, Quilting and tagged Blog, Quilting on November 17, 2008 by mpeagler. 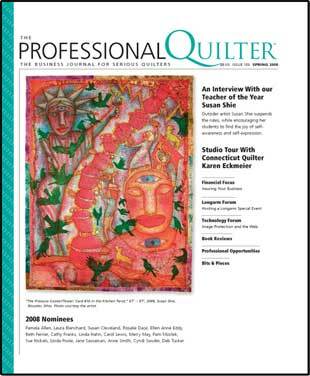 I’ve got an article in the upcoming issue of Professional Quilter magazine called Developing Your Blog as a Marketing Tool. I love blogging. I get to write daily posts that let readers know a little about me and my work and connect with people not only in my own community, but across the globe. However, developing a blog can be frustrating. There is no how-to manual on how to do it, and help is often scattered. So, I read lots of other blogs and learn from them. I especially enjoy educator blogs. Teachers are angels who devote their time to our precious babes, and teachers’ blogs are fantastic. I used to homeschool my kids and I would have loved to have known about the blogging world back then. Cool Cat Teacher is a middle school teacher in the tiny town of Camilla, GA. She is a techno wiz and explains a lot of the blogging world and the web. If you have kids, don’t miss her post on 11 Steps for Online Supervision of Your Child. I have learned enormously from her blog and look forward to her posts. Cogs for Blogs is a brand new blog but beautiful in its simplicity. I wish it had been around when I began blogging, because in one place, Lenva has collected instructions for many of the tools I offer on my blog that took me months of searching for how to do them right. What kinds of stuff? Linking to my email, doing a Slideshare, changing your blog header, along with others. It’s a site targeted toward teachers, but don’t let that stop you. You can learn from it as well. So, watch for my article, and in the meantime, trick out your own blog. This entry was posted in Blog, Learning from the Masters on June 26, 2008 by mpeagler. I’m On Mary Lou’s Blogroll! I feel like I’ve arrived. Mary Lou Weidman has added me to her blogroll. Wow. I’m so honored. Mary Lou is one of my all-time favorite quilters, not only for her courageous use of bold colors, but also for her gracious and optimistic attitude. I have all of Mary Lou’s books, and I’ll be adding her newest to my library as soon as it comes out. Mary Lou has a fabulous website with all kinds of eye candy, and her blog is as inspirational and cheery as she is. Mary Lou is visiting my guild, the East Cobb Quilter’s Guild, in August, and you can be sure I’ll be in her class. Who would want to miss just being around someone so fun who creates such original and whimsical quilts? This entry was posted in Artist Dates, Blog, Learning from the Masters, Quilting on June 17, 2008 by mpeagler. I’ve noticed on my blog statistics that I get the most traffic from images of my quilts on the major search engines. I know that people are downloading these, even if my art is copyrighted. It happens. So how you do make sure you get credit for not just the image but for the art itself? Title your photograph with the name of the artwork and your name. The photo accompanying this blog is titled with both the name of the quilt and my name, so any sneaky downloads will reference back to me. Thanks to Alyson of ArtBizBlog and Brian at ArtStudies for this tip. This entry was posted in Blog, Quilting on February 26, 2008 by mpeagler. This entry was posted in Blog on January 29, 2008 by mpeagler. The folks at Slideshare selected my Making a Quilter’s Color Wheel tutorial as a featured slidecast. Thanks Slideshare! Sweet. This entry was posted in Blog, Quilting on January 16, 2008 by mpeagler. Blogs bring the world to my laptop, but I also enjoy the local ones. I’m a regular reader of Georgia on My Mind, which features a weekly Georgia Blog Carnival, and this week it’s hosted by Marketing Through the Clutter. If you’re a Georgia Peach (international readers – it’s our state fruit), or just strive to be one, head on over and check it out. You get a great feel for what’s going on in this wonderfully diverse and culturally rich state. This entry was posted in Blog on December 22, 2007 by mpeagler. After months of attempting to figure out what was wrong with my blurry blog header image, Judy Perez of Painted Threads pointed me in the right direction. I had searched for the answer online extensively, and no one had ever written about this, so I’m doing it now. Supplying your own blog image header requires that you crop your image to the correct size of your blog header. In my case, that was 950×200 pixels. I cropped image after image in Photoshop Elements, only to have the image become horribly blurry. I tried to improve the resolution, to sharpen it, and nothing worked. Here’s the secret: You can’t use an image that was photographed at too low a resolution in the first place. You must take a photo intended for a blog header at a higher resolution than normal, since the pixel width required for a blog header image is wider. My photos taken at the 3:2 resolution setting didn’t have enough pixels to show the detail necessary when I cropped them. So I changed the setting on my camera to use a higher image size (5M) which contains a higher number of pixels. I could then crop the image and the detail was much better, with no more blur. Note to Mac users: I use iPhoto to upload my photos, as I find it infinitely simpler than Photoshop Elements, but iPhoto does something to the image size to make it smaller so it can easily display large numbers of photos. When I open the image in Photoshop Elements, it says the photo is only 72dpi. I double the resolution, to 144, which improves it greatly and allows me to crop the image with no blur. There may be a slicker way to do this, but this worked for me and hopefully it will help you too. This entry was posted in Blog on December 12, 2007 by mpeagler. Yesterday when I picked up my son from school, he asked me a question that came directly to the point: “Did you have a bad blog day?” It must have shown. Yes, in fact, I did have a terrible blog day. But it got much better, and the results are on this page. I owe a big thank you to Judy Perez at Painted Threads who came to my rescue. I have for months been trying to improve the quality of the photos you see in my blog header. No matter what I did, they were blurry, even when the original photo itself was crystal clear. I subscribe to Judy’s blog and admired her blog header, so I asked for her help, which she graciously offered. And now I have a nice, sharp, blog header photo, and can thank Judy for it. She was a lifesaver! I’ve been keeping a blog now for over a year, since October of last year. I’ve found it to be an extremely rewarding endeavor. I’ve been able to share and connect with quilters worldwide, which I could never have imagined when I began blogging. I’ve also found developing a blog to be extremely challenging. I love technology, as I was a Computer Science minor in college, and made my living being a technical writer and courseware developer. I have seven published books on software applications, several of which won prestigious awards. I lived and breathed hi-tech. Since having children and staying home to raise them, the hi-tech world has changed at an even faster pace, and I struggle to keep up with it and my busy family life. Blogs were a new development, and I was fascinated at the ability to connect with so many other like-minded quilters and artists, especially since I live in a remote area. I was excited to embark on the blogging adventure allowing me to combine my writing, hi-tech skills, art and quilting. One year later, I’m bowled over that people as far away as South Korea, Brazil, Japan, and Israel read this blog. I’ve learned so much from other bloggers, about quilting, blogging, and art. It’s a generous community that puts in so much time into what really amounts to a labor of love. This entry was posted in Blog on December 11, 2007 by mpeagler. Maybe it’s not quite that exciting. But – I’ve added the option of subscribing to my blog via e-mail! All you need to do is click the button in the sidebar at left. You’ll receive my latest postings, photos and all. You can even comment on the post, email it to friends, and rate it. It’s a great way to get a treat in your mailbox – the next best thing to a fat quarter sent from a friend. This entry was posted in Blog on August 1, 2007 by mpeagler. I changed subscription options on my blog. I was offering subscriptions through Feedburner, but it wasn’t displaying my entire posts or photos in blog readers. So I replaced it with a Bloglines button so you can subscribe directly through Bloglines. I’ll be adding Yahoo buttons as well as others, so let me know what newsreaders you use and I’ll be happy to add those. Soon I’ll be adding the option to subscribe via e-mail, so you can receive my blog postings in your e-mail inbox. Coming soon! This entry was posted in Blog on July 31, 2007 by mpeagler. I’m moving the color palette lessons from my old blog home to here. I’ll be categorizing them so you can find them easily and refer back to them. Let me know if you have any trouble finding them. Ten lessons are available on topics from Assembling Your Color Kit to Understanding the Characteristics of Color. After reading through these and doing the exercises, I promise your understanding and mastery of color will blossom! This entry was posted in Blog on June 25, 2007 by mpeagler. Welcome home! I hope you like the new place. Moving is always so difficult for me, and I so loved iWeb. But I had overtaxed iWeb’s abilities and it couldn’t handle the number of postings I had, so it was time to move on. I am excited for you, dear readers, as this blog will be much easier to use and navigate. I’ll have categories, archives, tutorials, and all kinds of neat opportunities for you to learn and share! I have a bit of a learning curve now that I’m using WordPress, but I know you’ll patient with me. I promise I’ll have all the lessons and links you’ve come to know and love. Each time you visit I’ll be offering something new and exciting! What do you think? Thanks for coming to my housewarming party! This entry was posted in Blog on June 23, 2007 by mpeagler.